Hartman Reserve Nature Center is located on the last sizable tract of wilderness remaining in Black Hawk County. Within its 80-acres are found an upland forest and a river floodplain with ponds, marshland and meadows. 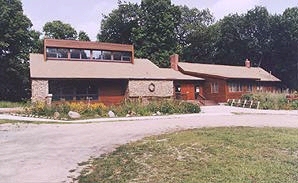 The YMCA purchased most of what is now the Reserve in 1938 with funds contributed by Waterloo publisher John Hartman. The YMCA used the site for a campground and recreation area. Purchases in 1949 (including land within the Cedar Falls city limits) and 1959 expanded the site to 87 acres. Seven acres were sold in 1966 to provide a location for River Hills School. The remaining land was sold to the Black Hawk County Conservation Board in 1976 for use as a year-round educational and recreational facility. Hartman Reserve is now open to the public without charge for walking, hiking, bird watching, photography, astronomy and cross country skiing. A naturalist at the Reserve conducts free field trips and workshops for schoolchildren and local groups. An interpretive center includes exhibits about the varied plant and animal life to be found in the Reserve. For more information about Hartman Reserve Nature Center and its programs, call 277-2187.